Hang on to your horses, ladies and gentlemen, because these cowboy beans pack a punch! Made with sinfully delicious bacon, this chili/stew (whichever you prefer) is hearty and packed with different tastes; from chilis, to garlic, to honey, this dish covers the flavor spectrum, and we really think you should try it! 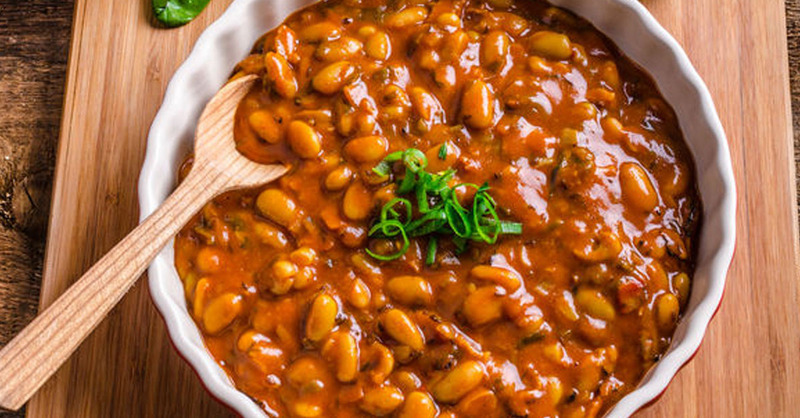 When temperatures dip, or when your day needs a little boost, these cowboy beans are here for you. Plus, the potatoes balance everything out and top of the whole meal in a special way. For those of you looking at this and thinking Ooh, looks great, but it must be super spicy!,” don’t worry. Take out the jalapeno and some of the chili powder and you’re good to go! If you’re trying to stay warm or if you just want a yummy meal your family can bond over, try this and enjoy! In a large stockpot or Dutch oven over medium-high heat, cook bacon until crispy, and fat is rendered. Add onions to the pot and cook until softened and translucent. 6-8 minutes. Add minced garlic and jalapeno and cook for 2 minutes, stirring frequently. Optional: transfer vegetables to crock pot or keep on the stove. Pour beans into Dutch oven and add honey (or brown sugar), barbeque sauce, ketchup, vinegar and Worcestershire sauce, and stir well. Season with chili powder, salt and pepper, and cook on low heat for 4 hours. While beans are cooking, prepare potatoes by cutting off a little slice on the bottom so that the potatoes sit solidly on baking sheet. Carefully cut horizontal slices along the length of the potato, leaving 1/4-inch at the bottom so potato doesn’t fall apart. Drizzle olive oil over the tops of the potatoes and sprinkle them with Parmesan and sea salt. Cover with aluminum foil, place in oven and bake for 30 minutes. Uncover and bake for another 15-20, or until fork tender.